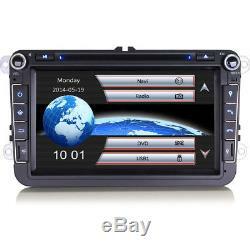 8 GPS Sat Nav Radio Bluetooth Car DVD Player USB Stereo For VW Passat B6 B7 CC. UK Based VAT Registered Company. We Are Specialists In What We Sell. Our DJ-Series head units are excellent after-market head unit upgrades from the standard factory units. 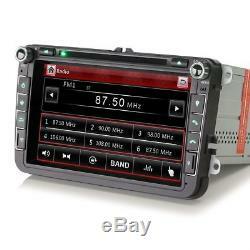 Running with a MTK3360 800MHz CPU and Dual Core ARM9 & ARM11 Cortex processors, this head unit offers Analogue Radio, Multi-Media (USB, SD, AUX & iPod), DVD/CD and Bluetooth, all at an affordable price-tag. Our units are built with the very best components. 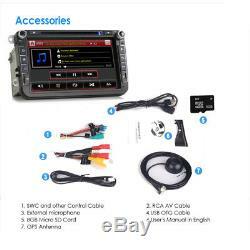 We use a Silicon Labs Si4745 premium radio receiver for quality radio reception, a DSP processor for ultimate sound, a SANYO 860C DVD/CD driver with a SUNPLUS 8202 VGQ decoder and a Samsung 800x480 WVGA Advanced 4-Line Digital Touch Screen. The unit is also made up of quality components from Sony, Hitachi, Panasonic and SiRF. 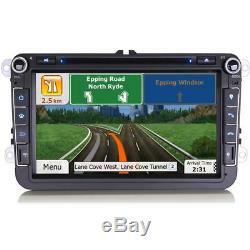 Sat-Nav GPS Navigation: We use our own customised NavTeq based maps for the navigation system here. Supplied with UK, Ireland & Western European maps as standard, the long Euro road trip may actually be a reality now! Everything you could want from a navigation system is here. Search by using a full postcode, POI or by street and city. Nice clear mapping with audio directions assisted by lane guidance and junction view means you will never get lost again. You will need a 1m or 2m Apple cable to plug into the USB port on the rear of the head unit (cables not supplied with the head unit). Then you can play your music straight from your Apple device onto the designated iPod mode. It will display all the song information and album art (if assigned). However, please note: As Apple continuously perform iOS updates, it can interrupt this mode. Apple are trying to make their method of playing music only compatible with their own Apple Car Play products, therefore reducing the chances of this always functioning. Please Note: Part Number JES-IP150 required to decode the Apple software to enable the unit to read it. Bluetooth: Built in Bluetooth means you can keep your eyes firmly on the road whilst having the ability to make and receive calls hands free. Get a call whilst listening to music or the navigation, the unit will allow the call and when you're finished it will resume back to its current function. You can view your dialled numbers, received numbers and your missed calls numbers. You also have your phonebook on the unit and you can search easily. It will arrange the phonebook by favourites and then alphabetically. Log on to Facebook or Twitter, check what is happening with the latest on the social. You can visit Google Maps and suddenly you have a FREE, accurate and regularly updated navigation system. Maybe visit BBC iPlayer and catch up on the TV you havent managed to watch. You could even visit Just Eat or Hungry House and place an order for some food so its ready for when you get home! 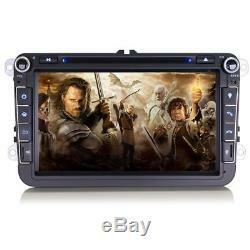 The possibilities are endless with the Internet in your car. Multi-Media: Playing music by SD card and USB is brilliant on the DJ-Series units, you can access file playlists and more importantly the head unit will display all the song information and album art (if assigned). It will even show lyrics of the song too (if assigned to the file). The DJ-Series units will support SD and USB media drives up to 16GB. You also have a Virtual CD Player (VMCD) function on the head unit where you can copy CD's directly to a media device. Direct Fit Terminals: A fantastic feature of the DJ-Series units is they don't have any wiring adaptors. They are designed to take the factory audio power plug directly, so they even plug and play like factory units. Also if you have a standard AUX port or USB port, the units will also support the factory plug fitting for them too. The aerial socket will also be designed to be a plug and play fitting. Steering Wheel Controls: The head unit will retain the steering wheel controls. No extra wiring needed, it's all plug and play. Rear View Camera Input: The unit has a dedicated camera input with super fast auto activation when the reverse gear is activated. Dont wait up to a minute to view your camera image like with lower quality systems. The DJ-Series System activates faster than its rivals! CAR INFO mode: The head unit has a programme called CAR INFO and on here you can view key information about battery voltage, fluid, temperatures, RPM and mileage all on the head unit. In order for this to function, your model will need to be after 2009/2010 with an unlocked ECU with OBDII release information. Not all models are supported by this, it is completely dependant on your vehicles ECU releasing this information to the head unit. Dual CANBUS Compatible: The head unit will be read by the ECU as a factory head unit. If installed correctly, you won't have any battery drain with the stereo. If your vehicle has the factory fitted OPS or Park Pilot parking system, the unit will retain them. If you have a model with the Digital Radar A/C on the factory screen, this will also be retained with our head unit. Digital TV Kit: JES-DV255 Required. DVR Front Safety Camera: JES-CA456 can be used with this head unit. The items offered for sale herein are not Volkswagen products unless specified. Use of this website signifies your acknowledgement and acceptance of this information. FREE Off-Line Android Navigation Maps Provided With Full Post-Code Search, Lane Guidance & Junction View. UK, Eire & Western European Mapping (Alternative Options: USA & Canada OR Australia & New Zealand). Direct Terminal Factory OEM Plug Fitment For Audio Power Connection. Works With Factory Fitted Steering Wheel Controls. Internet Ready (3G Dongle JES-WF166 Required). Built-in Bluetooth For Hands-Free Calling & Music Streaming. Wireless Bluetooth Microphone Built Into The Stereo Face. IPod Ready With Artwork Display With Track Name, Artist & Album View. Will Play 720p & 1080p HD RMVB Files. 7 Colour Choices For The Button Illumination (Red, Yellow, Cyan, Green, White, Blue, Purple). Dual CANBUS Enabled For Car Info Link (For Models After 2009). Retains Door Opening Display (For Models Which Originally Supported This). Supports Radar Digital Air Conditioning Display. Works With Standard OPS & Park Pilot Parking Sensors. 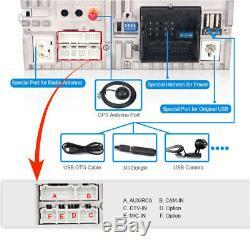 Will Work With Factory USB Port. Will Work With Factory AUX Port. PLEASE NOTE: This stereo has the VW Twin Diversity (single white plug) aerial fitting on the back of it. You may require a different aerial fitting depending on your model. At ATD, although we would like to avoid using phrases like Plug and Play, we know that installation is not always this simple especially with certain vehicles as there are many variations of antenna setup depending on the OEM unit removed, it is always best to check which connections you require before fitting the stereo so you can order any additional accessories. Part Number JES-IP150 required to decode the Apple software to enable the unit to read it. Designed to give you that easy system feel, the DJ-Series interface greets you and everything you need is right at your finger tips with easy access to the radio and the navigation modes. With a simple scroll up and down, you can view the second page of the main menu, here you can play with the VMCD player and you also can access the camera. If you have OPS (Opticial Parking Sensors) then this will function with it and you can view the radars on the screen. This is designed for the range advertised, so it will work with the Can-bus system, showing you the A-C and other features that can be controlled by the UI. It is also compatible with the OBDII display so you can view the engine management. It will also help you be bump free by working with the OPS too. You have the standard TA, AF and PTY functions as well. As this system works with the Can-bus electrics on the car, it will display the radio frequency on your dashboard display. Designed with the iPhone range in mind. Simply plug in a USB to Lightening connector or USB to 30pin lead to the rear USB slot (cable not supplied) and the head unit will read the iPhone or iPod and you will have full access to the music on there. If you use album art as well, the unit supports it! Built in Bluetooth means you can keep your eyes firmly on the road whilst having the ability to make and receive calls hands free. Streaming your music via A2DP Bluetooth is easy. Once paired, simply stream the music and control the music from the head unit. Play media directly from your USB memory stick (not supplied). You can play music media via Mp3 or WMA. You can play movie media via AVI, Mp5 or RMVP in full 1080p high definition! The user interface will display the file information (if assigned). Our Virtual Music CD Player is a great way of offering you a modern day CD multi-changer. You can copy up to 10 different CD's directly from the CD - DVD drive onto either a SD card or USB memory stick. The sky is the limit! Just like with our USB and SD card function, you can play music media via Mp3 or WMA. A standard function that is way too overlooked these days! With a selection of pre-installed games you are never going to be bored whilst stuck in the car. Have a game of Chess, play some Tetris or even play your hand at a game of Poker. With 6 games to choose from, you can keep the mind active. The unit will come supplied with our own customised mapping application. Using NavTeq maps, you know you will find your way with ease! With full postcode search, junction view and also multi-route planning you will never need a map again! UK, Eire and Western European maps are standard on this unit. The unit is compatible to support to the steering wheel controls. You can assign each function to have it how you want. Very simple to set up and save. Also, if you car has it, you can answer and end Bluetooth calls from the stalk control. This custom fit head unit is designed to be a direct fit after-market replacement head unit for the original fitted head unit. The unit is supplied with a matching audio plug fitting from what should be standard, for a simple plug and play installation. Please read the fitment notes (if any) assigned to this product as we try to advise as many points and possibilities as we can. The fitment guide is given as a guide only. Each vehicle may have a variation so please make sure you've checked everything to be sure the product will be suitable. VW Amorak (2010 - Onwards). VW Beetle (2006 - 2010). VW Bora (2005 - Onwards). VW Caddy (2003 - Onwards). VW Eos (2006 - Onwards). VW Golf Mk5 (2004 - 2009). VW Golk Mk6 (2009 - 2013). VW Golf Plus (2008 - 2012). VW Jetta (2005 - 2010). VW Multivan (2004 - 2008). VW Multivan (2008 - 2015). VW Passat CC (2009 - Onwards). VW Polo Mk5 (2006 - Onwards). VW Scirocco Mk3 (2008 - Onwards). VW Sharan (2008 - Onwards). VW Tiguan (2008 - Onwards). VW Touran (2008 - Onwards). VW Transporter T5 (2005 - 2009). VW Transporter T5 (2009 - 2016). SKODA Fabia (2007 - Onwards). SKODA Octavia (2004 - 2013). SKODA Roomster (2004 - 2013). SKODA Praktik (2007 - 2013). SKODA Superb (2008 - Onwards). SKODA Yeti (2009 - Onwards). Check stereo shape and fitment type. Does NOT replace square 188mm wide "key release" radios. 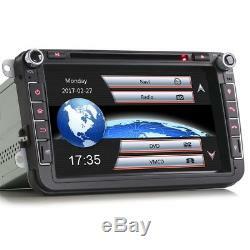 Does not replace factory fitted Balero, Stream or Melody head units. If your factory stereo is the Swing 225 or Balero 225, then you will require a fascia Product Code. This unit is known to replace standard stock radios like. IMPORTANT INFORMATION: The fitment guide is given as a guide only. This item has the Twin Diversity white plug aerial fitting directly on the rear. Depending on the aerial fitting on your vehicle, you may require an adaptor in order to connect. Some Skoda & SEAT models may require a fascia to convert the dashboard to allow this unit to be fitted. Some vehicle on this list have a variation in the dashboard which means a different shape stereo is fitted as standard. For VW Transporter T5 models between 2005 and 2009 that are non-CANBUS applications will require a +12v ignition live to be fitted. Voice Guidance: Yes - Support 2D/3D Map Views: Yes - Dual Zone: Yes, navigating while music playing - 8GB TF Card included: Yes DVD - Decode IC: SUNPLUS 8202VGQ - Compatible Format: DVD, DVD-R/RW, HDVD, MP3, MP4, CD-R/RW, VCD, DIVX, WMA/JPEG - Audio/Subtitle Languages: English, Italian, French,ish, Portuguese, German, Russian, Arabic.. 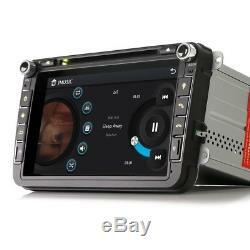 The item "8 GPS Sat Nav Radio Bluetooth Car DVD Player USB Stereo For VW Passat B6 B7 CC" is in sale since Thursday, September 7, 2017. This item is in the category "Vehicle Parts & Accessories\In-Car Technology, GPS & Security\In-Car Entertainment\Car Stereos & Head Units". The seller is "audiotechdirect" and is located in UK. This item can be shipped to all countries in Europe, United States, Canada, Australia.